As I recently replaced my dew wipe I had the door apart so I took a ton of pics. What I offer here is for the new Fiero owners who want to do the work themselves. I welcome any comments from others to help cover any mistakes I make or to offer an easier way for the beginer to do this. The pics are from my '84 with power windows, locks and mirrors. 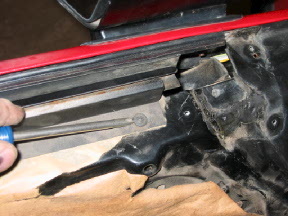 I have another thread you can find by doing a search for "How to remove inner door panels, with pics." At this point I will assume you have the inner door panel off. First remove the rubber end caps from the frame, two philips screws on the back one and three philips screws on the front. They are glued down with a small amount of sealant but peel up easily. Next remove the inner window seal, it's held in place with six philips head screws. 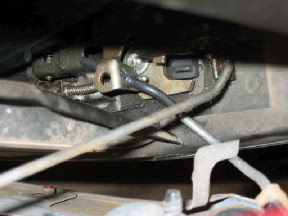 Next remove the two 10mm nuts that hold the mirror in place, a little liquid wrench or WD-40 on the nuts will help, an open end box wrench works best, don't worry if you drop the nuts inside the door you can retrieve them soon anyway. 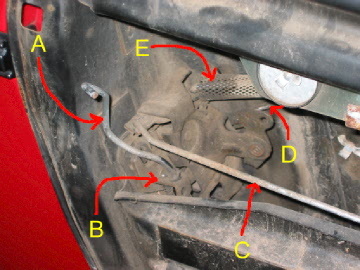 Note how the power mirror wiring harness (or the manual control cable) is routed behind the window guide, make sure when reinstalling these they are in the same location so as not to interfere with the windows operation . Now unplug the wiring for the mirror and take the mirror off, if you have a manual mirror you will have to fish the whole control cable out but it's not too hard. Now remove the seven plastic looking screws that holds the door skin edges. There are four at the rear and three at the front. On the '84 they are philips head screws, '85-'88 are torx bit screws. If they strip out it's not the end of the world just a pain. I have found if you use a razor blade (be careful) you can shave the top of the plastic off to expose the actual metal screw holes and use them. 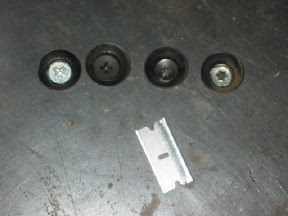 Here is a pic of both the philips and torx intact and with the tops shaved off. Now remove the moulding strip, start at the front and using a small flat blade screwdriver pry at the top corner of the moulding while pushing up on the bottom of the moulding, the top edge should come away from the door, then push down to disengage the bottom from the clip. Now move down a little and again pushing up pull the top edge of the moulding away from the next clip. There are a total of four clips five if you count the front one. 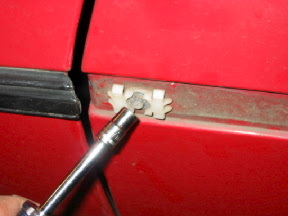 When all are loose you will find a small christmas tree type push fastener holds the back end under the door handle, pop it loose with a small flatblade screwdriver and the moulding is off. 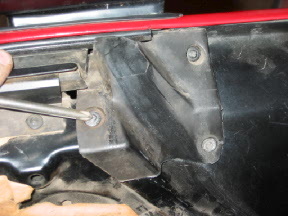 Now remove the front moulding clip using a 7mm socket or nut driver and then the rear 7mm screw near the key lock. 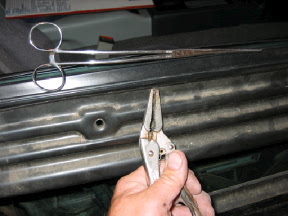 This is a pic of one of the four moulding clips, to remove them from the door use a small flat blade screwdriver to lightly push down on the little tab in the center that goes into the door while pulling out on the clip, a needle nose pliers helps here. Do not be suprised if the little tab breaks, I usually break half of them when I do it, not a big deal, just buy some new ones. 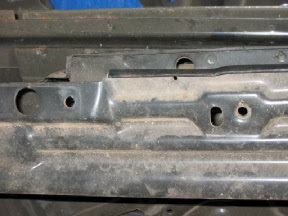 This is also a good pic to show what you are pushing up against to release the moulding from the clip. 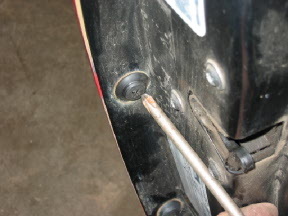 Now go to the bottom edge of the door and you will find four plastic rivets, use a small punch to punch the center out, you will then be able to pop the rivet out using a flat blade screwdriver or side cutters. 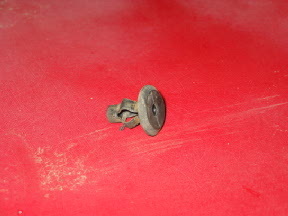 Here's a pic of a removed rivet too. 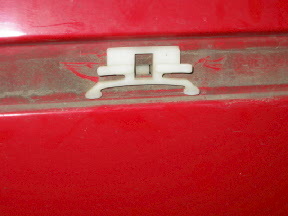 On the '84 door the top edge is held to the door frame with three christmas tree fasteners, '85-'88 have a lip molded in the door skin that hooks over an edge on the frame. 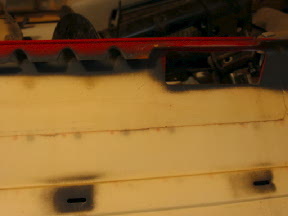 Pull the '84 skin away from the door frame at the top and the fasteners will come loose. On '85- '88 door skins pull the bottom of the door away from the frame slightly and lift the skin up to disengage the skin from the frame. At this point the only thing holding the skin to the frame is the lock rod and door handle rod. 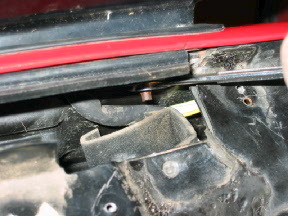 Remove the clip that holds the rod to the lock cylinder. 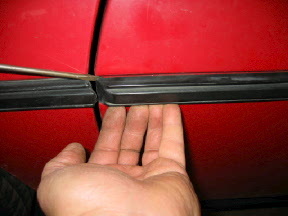 The rod that goes from the door handle to the latch mechanism just sits in a hole and will come loose when you slide the skin up and away from the frame, or you can undo the plastic clip that holds the rod to the door handle. That's it for the door skin removal, the dew wipe is now easy access, you can get to all but two of the screws which sit behind the window glass. These can be removed with a tool that Rodney Dickman sells or you can use a needle nose vise grips like I did to turn the screws in from the outside. As you can see from the pic I used an old forceps to hold the screw in place when I reinstalled it, I used the vise grips to tighten the screw from the outside, as this is a self tapping screw there is a little bit of the end to grab without trashing the screws threads. 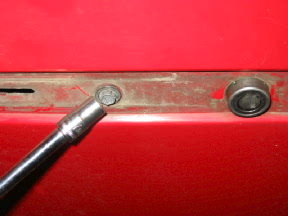 If you are in this far and have power locks that don't work or you have to hit the button several times here's an easy fix I have done on four doors. 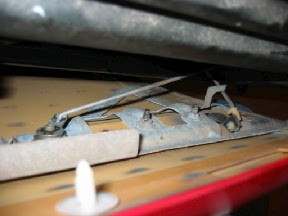 Remove the rods from the latch mechanism and the three torx bolts that hold the latch to the frame. Clean all the old dust and grease off the latch with whatever it takes and then regrease the whole thing using a spray grease that will stay on and not run off. I used a spray grease that gels up shortly after it's sprayed on. Reinstall the latch and hook the rods back up. I have not done anything to the lock solenoid (it's really a lock motor) and have had excellent results. Tech tip: When removing the outer molding you can reach through from the inside of the door and release the clips if the window is up. My clips were pretty stiff from age and would probably have broken if I had tried prying them off from the outside. 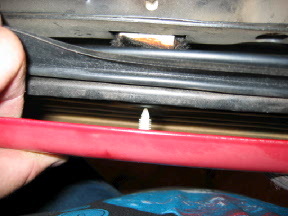 On my 87 GT there was a metal piece in the way of me getting to the outside of the screws directly. Basically, it didn't get me anything to pull the outer skin off. It was a lot of work and I didn't have any replacement rivets for the bottom of the door. Tech tip: once you're commited to changing the dew wipes go ahead and cut away the majority of it. It will make it easier to get at the screws with Rodney's tool. I had the problem where the tool wouldn't fully engage the screw because the dew wipe was too stiff. It worked fine after I cut most of the dew wipe off, right down the crease. wow, great instructions with good pics! It might be worthwhile to mention that you don't need to remove the outer door skin to replace the dew wipes though. Thanks, You are right, it is not necessary to remove the door skin to do the dew wipes, I replaced mine when I had the door apart and threw in the info on how I did it in response to an e-mail I got about this and my other post about removing the inner door panel. Outstanding post. Very well done. Thanks. This post couldn't have been posted at any better moment than now!! I have to remove my outer door panels to repaint them (with the rest of the car.... pics coming soon!)!! Great Post! Just in time too. I am needing to replace my right door skin. Thanks!! Wish that I had seen this last week. Did mine for the first time and the instructions & pics would have made it much easier. Your info is dead on. On my next project I will take the time (we all should)to shoot some photos also so we can all have a reference to view. p.s. even though I'm ranting, lets not hijack this ABSOLUTELY WONDERFUL POST!! If you want to correct my political position on rating systems, pleas PM me. It's been months since I had a PM anyway! I think you should have made the Haynes manual! Hey whats that wink for. Thats a very serious statement. HoHo you seriously should have. Just the color pics alone makes a big difference. Yes I agree you picked a very good time to do it as well. My power locks were (past tense! ) sticky, and I have a side mirror to replace. You posted your 'how to remove inner door panel' thread the day after I had my mirror ripped off. And now, thanks to this thread I don't have to ask the question of "wheres the mirror mount bolts?" Great timing as I probably would have pulled the skins off fron the top and broken the lips (86GT) on the top of the skins. Jeez guys, my head is swelling up, thanks for the positive response. I did this thread as I had time and a camera, I see new guys and a few old members posting questions that need this type of response, this is my way of paying the forum back for all the good info I have found and the great people I have met because of it. I have several pics to add to help show the differences between the 84 year and 85-88 years door skins. 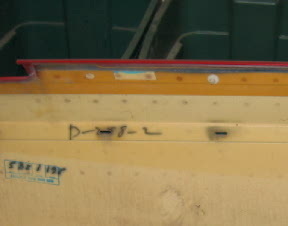 This first set of pics show the inside edge of the 84 door skin and then the 85-88 door skin. The next set shows the difference between the actual door frames of the 84 and 85-88. OUTSTANDING THREAD!!! This IS what the forum is meant to be!! You just got a **+** from me too..
Have you RATED me today?? Since I don't have 30 posts to vote a "+" for you I am thanking you here. There will be one from me for you and several others that REALLY deserve it! 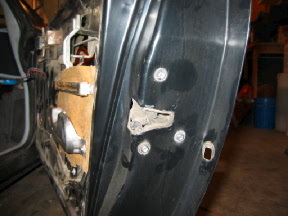 I am getting ready to replace my driver side door due to a very big hole in it. 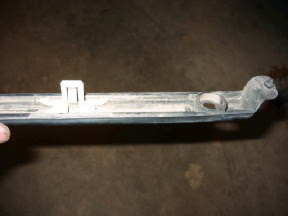 This will really help me get the old one off, hopefully with relative ease, on my 87 coupe. Also, thanks for showing the differences between door frames and skins between the model years. I have learned alot already from this forum, and members like you REALLY HELP! As do many of the others that have posted and helped others and myself out! While I had the doors apart installing the pw/pdl in my 85SE I also replaced the outer dew wipes. I couldn't get a bite on the two hard to get to screws with the tool I got from Rodney. I researched my archive of printed forum posts and found one that had instructions that worked for me. I don't have the info with me here at work so I can't post a link. 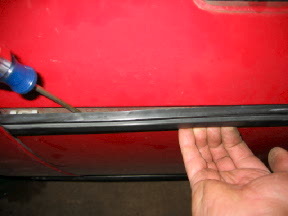 In this procedure I removed the upper window stops from the door and loosened the bolts holding the vertical track near the rear side of the door. I could then raise the window enough to get the roller out of the vertical track which allowed me to slide the glass forward and backward enough to get to the screws with a regular screwdriver. It sounds complicated but turned out to be very easy. 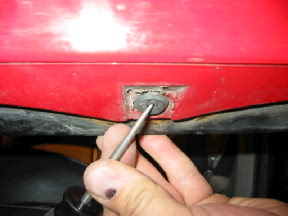 Be sure and mark the position of the bolts before you remove them so you can restore their position when complete. (you will need to remove the rubber molding from the front and rear edge of the glass and the mirror as in the procedure above). While I had the door apart I sprayed lithium grease on all the moving parts of the lock mechanism and the window tracks. 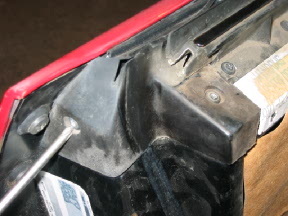 One of the places that causes the most friction in the lock mechanism that I see is the plastic guide that the lock rod snaps into between the lock mechanism and the inner door handle. You can see it when the inner door panel is off. I just unsnapped the rod and squirted a small amount of the white grease on it and re-snapped the rod in place. 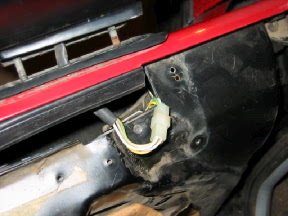 When we did the dew wipes on my Fiero my father in law came up with a very nifty trick for holding the little screws when reinstalling. He cut some small plastic tabs using the clear plastic from those blister packs (you know, the stuff that is impossible to open). The tabs were about 3" long and 1/2" wide. He screwed the dew wipe screws through the ends of the tabs, and then used to tab to hold the screw in place while we got them started. Once they were snugged down, a firm tug on the tab broke it free of the screw and we were able to tighten them down using Rodney's tool. I sure am happy that you did all of this for us! Now I can finish pulling off my door skin without wrecking something. I have seen several fieros with the outer skin cracked at the mirror. is there something that I should look for as my 1986 is cracked in that same location also. not sure if its a cold weather stress point or something else. I was gonna try to fix mine soon. thanks for this write up. Thanks for a great write up and pictures! 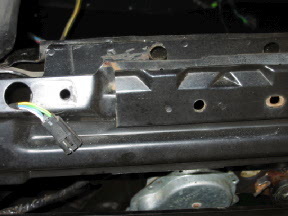 I need to pull the door skin off to access the window regulator. It makes a noise about half way up. I think it's the spring. With the door skin off, I should be able to diagnose it correctly.